Denver’s Newmont Mining corporation has a dark reputation in South America judging from the graffiti, the signs at marches, and according to those who support human rights. Locally the corporation has a shiny reputation for its occasional donations to local causes including playground equipment and even co-sponsoring a April 2017 forum organized by the Getches Wilkinson Center for Natural Resources, Energy, and the Environment 2017 Martz Spring Symposium. For years, the company has been mining gold in the mountains above Cajamarca, Peru and had intentions of expanding operations. But a tiny woman with a small family, small hut, and small garden stood in the way. Máxima Acuña has been fighting the corporation for years in court. 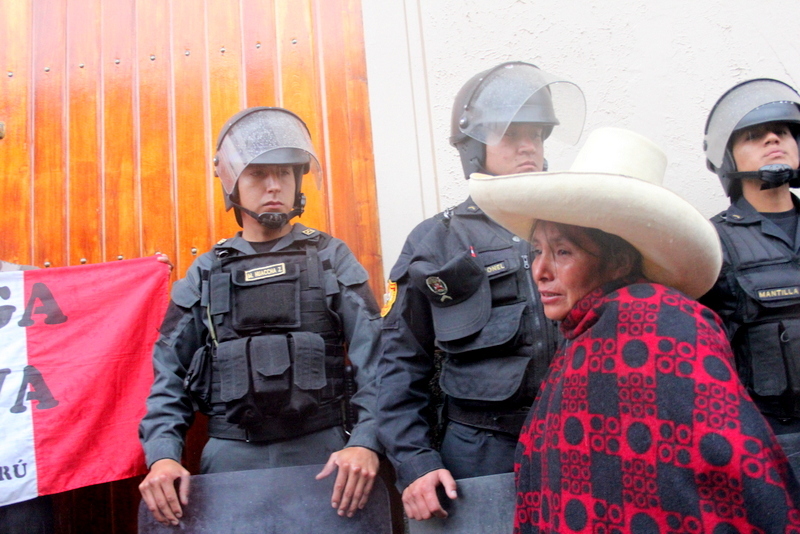 Newmont has tried to invalidate her land title, has used its security forces to physically intimidate the family, and this time attempted to have her charged and tried for usurping her own land. The Goldman Prize selection committee noticed and in 2016 awarded Acuña the prestigious Goldman Prize. Newmont wants her land to expand its gold mining operations and to construct an open pit tailings-pond on her land. Newmont is majority owner of the mine and shares ownership with Peruvian company Minas Buenaventura of Peru, and International Finance Corporation. Newmont has made several attempts to take the land of Acuña who lives high in the Andes and raises family crops on her small plot of land. The family has undergone several physical assaults and damage to the family home by security guards of the mine, and by state armed forces. Her crops have been destroyed, her animals have been killed, and a large metal fence was constructed by the company to prevent her from crossing to travel to town to sell her crops. On Monday, the Supreme Court acquitted Acuña of usurpation. Newmont and partners continue to claim that they have owned the property since 1996. Acuña’s title shows that she has owned the land since 1994. Newmont has been mining in the area since 1993 and reports nearing mineral depletion. Grufides attorney Mirta Vasquez speaks to reporters after winning an Appeal that attempted to remove Maxima Acuña from her land in 2014. Mirtha Vásquez, an attorney for the group Grufides that was awarded a Global Justice and Peace Award in 2010 by the Denver Justice and Peace Committee said that the company may now be liable for physical and psychological damages that the company has inflicted on the family. 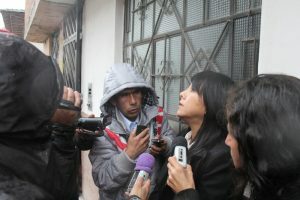 Vásquez has herself reported repression when her home was ransacked and unknown subjects were reported to be following the attorney and her colleagues in Cajamarca. It’s expected that civil proceedings could wind through the courts in a years-long process and Acuña might not see litigation relief from the reported repression anytime soon. This entry was posted in about us and tagged Conga, maxima acuna, newmont, yanacocha. Bookmark the permalink.